Spaghetti makes very good Biff bait. Hehehehe. Biff sure loves his spaghetti. Ah ha, just noticed the Star Wars reference in the title. IT’S A TRAP!!! How did that trap work? I mean, he’s just tied to a tree. That branch clearly wasn’t pulled down and something triggered it to snap back. 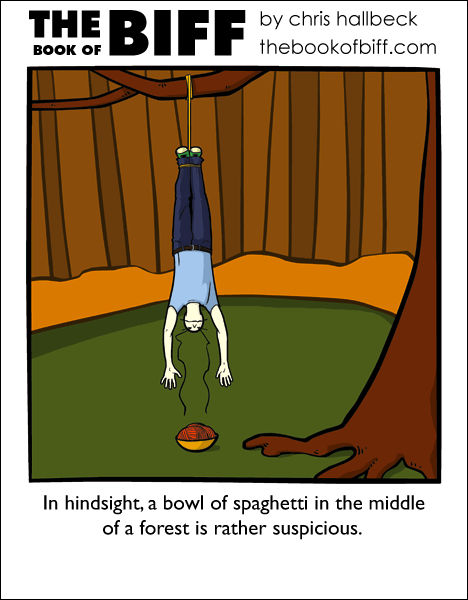 Somebody must have physically tied Biff to that tree, and that person then left the bowl of spaghetti just for spite. The fiend! oh good lord, a meme. We all know the Flying Spaghetti Monster was responsible. Woo! Book coming soon, I can hardly wait! Whoever trapped him will probably get arrested. You know…since spaghetti is illegal. Sleepingorange: General Ackbar (the fish guy from one of the Star Wars movie) shouts “It’s a trap!” at one point in the film. The quote “it’s a trap!” became an internet meme at one point. Chris is making a reference to the meme and quote. I actually never saw the “It’s a trap!” meme, I just always liked that line and have said it among friends for the past 20 years or so. So when *IS* Biff season? Also: Is it a crime to hunt Biffs over bait? Is it just me, or does spaghetti seem to cause Biff the most grief? I’d think he’d have developed a pavlovian aversion to it by now. … Unless we only see the random mishaps and not the usual noodly enjoyment? Spaghetti is outlawed too, isn’t it? I want a full size poster of this one. Oh, him and his spaghetti. No offense to you Chris, but honestly, I prefered your other ones, he doesn’t seem to get maimed as often, I loved number 102, and stuff like that doesn’t happen as much. But it’s still awesome, don’t get me wrong. Poor Biff, maybe he can get at the noodles with his eyebrows? Also, Ackbar is an admiral. In retrospect, I guess something seemed wrong once I was stuck in the tree…Too bad they couldn’t send out a handsome fireman. Poor Biff without his spaghetti. Chris Why are you so cruel to him? If that happened to me, the minute I got down someone would pay. I love spaghetti!!!! My grandma makes GOOD spaghetti…*dreams* I just had spaghetti for dinner. IT’S A TRAP! I love that line! Nonsense. Rebel Alliance Admiral Ackbar for the WIN! No, it’s not a trap, Biff’s hanging out with his best friend and favourite meal. Biff’s still trying to get the Spaghetti. It’s funny. Excellent choice of title, if I do say so myself. I suppose Biff really likes spaghetti, considering all the comics you’ve made of it. It’s about time it got him in trouble. I just recently saw the original trilogy again, so a few Star Wars jokes lost on me have come back. It’s like the bowl of soup that attacks you in the jungle on Improbable Island!